Healthy life is a heaven. Try out these safe and effective natural home remedies for correcting skin discoloration of the neck, underarms and inner thighs, under your eye and gain back the confidence to have a lighten your skin. The mild bleaching property of potato works effectively in lightening dark skin, but unlike the strong skin bleach, it does not cause skin irritation. The natural bleaching property of raw potato not only helps in lightening black under arms but is also the best way to remove dark circles around eyes. Take a medium sized potato, peel and grate it in order to extract the juice from the pulp. Use a cotton ball to spread this juice on the sides and back of your neck, let it dry for 30 minutes and rinse off with lukewarm water. Repeat this remedy 3 times a day for 2 weeks to get remarkable results. Just like potatoes, cucumbers also possess natural bleaching properties that help in lightening the darkened skin of the underarms. Cucumbers are an effective remedy for skin lightening if you have sensitive skin because it soothes the skin and prevents itching and skin irritation. Skin lightening tips are incomplete without the inclusion of lemons in it. When it comes to removing any kind of dark patches or marks from skin, there is nothing like lemon juice. Lemon juice is the most effective natural bleach which helps in lightening skin tan, treating age spots, pigmentation and hyper-pigmentation. The powerful antiseptic and antibacterial properties of lemon juice also help in getting rid of body odor. The benefits of coconut oil for hair and skin need no new emphasis. Coconut oil has natural skin whitening properties that help in lightening hyper-pigmentation, and also moisturizes the skin of the inner thighs in a nourishing manner. In addition, coconut oil is also a powerful cure for ring around eyes. Mixing coconut oil with lemon juice makes the remedy even more effective because it helps in removing the dead cells and blemishes. Application of honey on chapped lips is an age old home remedy for dryness of skin. What better way to lighten the skin of the darken area than with a nourishing honey, sugar and lemon Scrub? This is a moisturizing scrub that contains the hydrating properties of honey, which soothes the dry skin of the inner things and the exfoliating power of sugar, which helps in stripping off the coats of dead skin cells from the region. Mix 1 tablespoon each of honey and lemon juice, and add 2 tablespoons of sugar to it. Apply it on the inner thighs, underarms and gently scrub the region using firm circular motions for 10 minutes, leave the mixture on for another 15 minutes and then wash off with lukewarm water. Repeat this remedy 4 times a week for 2 weeks for amazing results. Aloe Vera is an amazing ingredient for all skin types which helps in soothing and moisturizing the dry skin cells of the inner thighs and underarms. The addition of pure almond oil to this pack makes it absolutely effective for skin lightening, because almond oil is rich in vitamin E, which plays a crucial role in lightening skin tone and improving overall skin health. Skin discoloration and hyper pigmentation is often caused by free radical damage, and pure vitamin E oil helps in neutralizing the harmful effects of free radical damage to the skin. Therefore, it can be used as an effective home remedy for lightening dark inner thighs. Aloe Vera gel or pulp helps in moisturizing the dry skin cells of the inner thighs in an intense manner. Take 2 tablespoons of Aloe Vera gel and add 5 drops vitamin E oil to it. Apply this mixture on the inner thighs, let it dry for 20 minutes then wash the region with water. Use this pack 2 times a day for 4 week for best results. Healthy reason to have a cup of Indian tea in morning! Chai is a Indian Tea and it can be very healthy, especially in the winter and also if you got cold or Sore throat.Indian Tea is more milk and less water but I prefer it with more water and less milk. I like Indian Tea everyday in morning, it's perfect way to wake up! 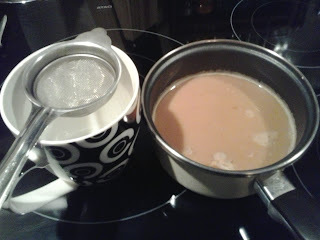 To make a Indian tea you can use a tea bag or loose tea (packet tea). I prefer Assam loose tea, it has a better taste for Chai but there are many alternatives such as Darjeeling tea bags or loose tea packet. I will give you the recipe I have perfected over time, but it will take a few turn to create Chai which suits your taste buds! I use Chia Masala (Dry mix of herbs) which can be bought from any Asian grocery store or supermarket. It can also be made at home according to your own preferences. If you don't want to use Chai Masala then simply use some Fresh Grated Ginger and 2 to 3 Cardamon pods. Blend everything together using a blender or a mortar and pistil make the mixture and store it in an air tight bottle. How to make a Indian Tea? In a small pan add water, let it boil then put tea or tea bag, Chai Masala (mix herbs) and fresh grated ginger. Let it boil for 2 to 3 min then add Milk and let it boil again till it rises. Finally strain the tea directly in to a cup. Common causes of hair loss include nutritional deficiencies, hormonal imbalance, stress, use of improper hairstyles, heating tools, chemical-laden hair products, genetics, and various other reasons. But you need not worry. There are some home remedies that can help nourish your hair and promote new growth. These remedies will prove to be highly effective if you follow them regularly for once a week. Curry Leaves is a good for hair loss and hair growth; Take some Curry leaves powder and make a past of them and mix this past with yogurt and massage on your hair and scalp. keep this mixture on your scalp for 30 to 40 minutes and then wash off with shampoo. Apply this mask every week consistently to see a good results. This will help you for your hair loss and get a good hair growth. 1) Put the hot oil on your hair and comb it through to ensure even distribution and reduce breakage during shampooing. Wear a plastic cap or wrap a warm towel around your head and leave it on for at least half an hour before shampooing. 2) Castor oil facilitates hair growth because it is rich in omega-9 fatty acids and vitamin E. The thick oil moisturizes your hair, adds volume, prevents frizzing, and also fights scalp infections.It is best to mix castor oil with an equal amount of a base oil to get a better consistency and enhance the benefits. Rub it on your scalp and massage. Leave it on for 30 to 45 minutes. Finally, rinse it out and shampoo your hair. If it is difficult to remove, use a clarifying shampoo.To make it more effective, mix four drops of rosemary essential oil in an ounce of castor oil and then use it on your hair and scalp. 3) Eggs; Hair is made up of keratin protein and eggs are a great source of protein. Thus, they are highly beneficial in helping your hair grow. 4) When dealing with hair loss, you can apply coconut oil infused with Indian gooseberry, or amla, to encourage hair growth. It will help greatly with premature graying as well. Alternatively, you can apply a mixture of one tablespoon each of dried Indian gooseberry powder and lemon juice. Simply applying fresh amla juice is also useful. 5) Lemons are rich in vitamin C and vitamins and other nutrients. Plus, they are loaded with antioxidants. In addition to hair growth, lemon juice promotes smooth, shiny, dandruff-free hair. When applied on the scalp, it stimulates circulation and hence prevents hair loss. Do not use lemon juice in excess though, as it can lighten your hair color over time. 6) Fish oils are rich in omega-3 fatty acids that not only promote smooth, shiny hair, but also encourage healthy hair growth. Oftentimes, a deficiency of these fatty acids impedes hair growth. 7) Mash a ripe avocado (pit removed) with one egg, then apply to wet hair. Avocados are rich in vitamins, minerals, and essential fatty acids that can help restore luster to your hair, says Stephen Sanna, expert colorist at the Pierre Michel Salon in New York City. Leave on for at least 20 minutes, then rinse several times. Repeat once a week for damaged hair and once a month for healthy hair. 8) Try a vinegar treatment; Whip up a terrific hair conditioner by combining 1 teaspoon apple cider vinegar with 2 tablespoons olive oil and 3 egg whites. Rub the mixture into your hair, then keep it covered for 30 minutes using plastic wrap or a shower cap. When time’s up, shampoo and rinse as usual. 9) Rub enough mayonnaise into your hair to coat it, wait up to an hour, and wash it out. You’ll be amazed at how soft and shiny your hair is, thanks to this great protein source. 10) Mix 2 ounces olive oil and 2 ounces aloe vera gel with 6 drops each of rosemary and sandalwood essential oils. Olive oil is an emollient, aloe hydrates, and rosemary adds body and softness. Belly Fat - Some Food Will Help! If you have been having problems on what foods burn belly fat, this listed foods will assist you greatly. However, there are other numerous healthy foods which can also assist you in burning the belly fats easily without being strained to tougher work outs. Belly fat burning foods are those foods that burn extra calories than the content of calories of the food itself, and reducing the amount of stored fat. There are some foods which in fact burn more fats than the content of calories of the food itself. They are natural plant foods containing high fiber and protein content suitable for burning the stomach fat. Do you have a bellied stomach and would like to know what foods burn belly fat faster? Then don’t worry. The following are foods which can assist you burn fats in the body and reduce belly flat. Caffeine Coffee; Caffeine coffee can enhance the movements of your bowel quicker than the standard rate. Bowel movements can remove excess toxins faster and provide less opportunity for the body to collect excess fats on your belly. You can take one cup of ground coffee, when you wake up after consuming one cup of boiled water, with wholegrain bread having strawberry jam spread on it. Whole Grains; Whole grains like corn and oats are low in fat and calories and are very rich in fiber. Nevertheless, whole grains might result in the bloating of stomach and make it appear fat. It may in the meantime make you feel full for longer periods than consuming carbs and thwart you from eating too much. When you wake up in the morning, you may prepare one bowl of oats with yogurt and provides adequate energy and maintain you satisfied for long. Walnuts; Walnuts consist of monounsaturated fats. They are a type of a healthy element. These monounsaturated fats can be digested easily and would not create any negative impacts on the body but will make your belly becomes flat. As per the scientific research, walnuts can only operate as an element to decrease the belly fats and regular everyday consumption of approximately 1 to 2 oz can assist in strengthening of your energy and minimize the risk of being attacked by heart related disease. Yogurt; Yogurt contains millions of probiotics and is a top dairy food. It has high protein and calcium content. Those elements are necessary to build your strength and maintain your body fitness. It never contributes to the growth of belly fats but reduces it. Green Tea; Green Tea increases the Metabolism. The polyphenol found in green tea works to intensify levels of fat oxidation and the rate at which your body turn food into calories. Bananas; Bananas are also another type of natural fruit containing low amount of calories and are very rich in fiber. Besides fiber, it also contains B6, potassium and magnesium. Those elements keep the blood pressure at average level. The B6 is an element which stimulates the immunization system and maintains the red blood cells. Most individuals are usually strict on the banana yogurt shakes, remove their skin and prepare a single cup of smoothies using a blender. They then keep it in fridge. It is a very healthy food to consume after taking tea during summer. You will enjoy it without worrying about excess fats being added onto your belly. Aerobic exercise like waking,running,swimming has been shone to cause major reductions in belly fat in numerous studies. Another study found that exercise completely prevented people from re-gaining abdominal fat after weight loss, implying that exercise is particularly important during weight maintenance. Exercise also leads to reduced inflammation, blood sugar and all the other metabolic abnormalities that are associated with central obesity. Healthy Skin; For young and healthy looking skin, almonds are just the right ingredient. They are also rich in vitamin E, a skin-nourishing vitamin that protects the skin from becoming dry. almonds are one of the most popular super-foods. While most people mistake almonds as nuts, technically they are the seeds of the almond tree that are contained within the fruits. Almonds come in two varieties – sweet and bitter. Traditionally, sweet almonds are edible, while bitter almonds are used to make almond oil. Both these varieties are easily available in the market. You can eat almonds as is or you can soak them in water overnight and eat them the next morning. You can also find almond milk, almond flour and almond butter in the market. It will protect your skin and heal from sun damage. 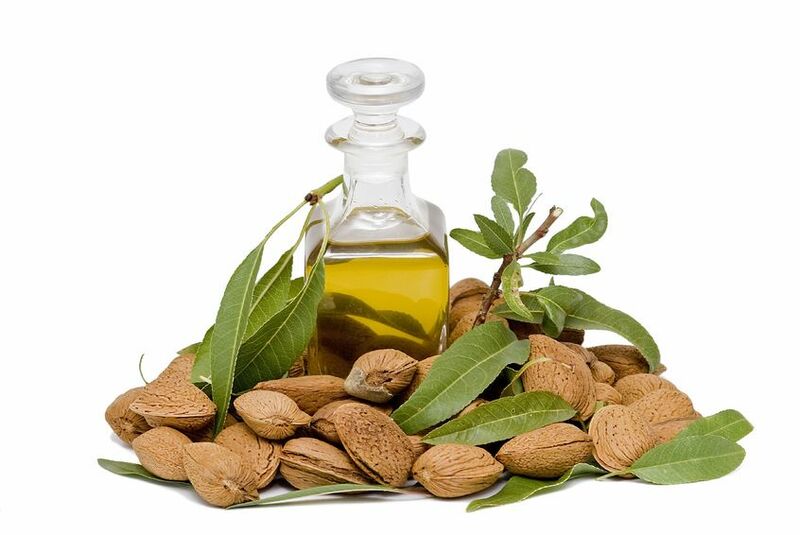 Instead of spending lots of money on anti ageing cream and chemical skin product, you can use a natural treatment as a almond oil. It will benefit your skin in long run without causing any harm to your skin. You can on the skin and in hair as well, it's so light, gentile and moisturizing that is great for baby massage. Good for Improving Brain; Almond are also considered one of the best food for your brain. The vitamin E in almond helps prevent cognitive decline, boosts alertness and preserves memory functioning. To boost memory and stimulate the mind, eat a handful of almonds everyday. Good For Heart; There are many nutrients in almonds that contribute to heart health. For instance, almonds are rich in magnesium, which improves blood flow and the movement of oxygen and nutrients throughout the body. This in turn can help control blood pressure and reduce the risk of heart attacks. your cholesterol. They help raise HDL (high density lipoproteins or “good” cholesterol) and reduce LDL (low density lipoproteins or “bad” cholesterol) levels. This is because almonds are rich in polyunsaturated and monounsaturated fats. Control Diabetes; Almond also help control blood sugar levels and prevent complication from diabetes. The healthy fats, vitamins, fiber and several minerals in almond help regulate the absorption and processing of glucose. For good healthy reason and to maintain a healthy blood sugar level, eat one ounce of almonds immediately before eating a large meal. Weight Loss; Almonds aid in weight loss due to their nutrient density. The fiber, protein and monounsaturated fat content of almonds can make you feel full and satisfied, so you’ll have fewer cravings and be less likely to overeat. They are also full of B vitamins and zinc, which help stop sugar cravings.Try not to exceed the recommended serving size of 1 ounce, or 23 almonds. Along with dry roasted almonds, you can also drink unsweetened almond milk to lose weight. Good for Improving Brain; Almonds are also considered one of the best foods for your brain. The vitamin E in almonds helps prevent cognitive decline, boosts alertness and preserves memory functioning.To boost memory and stimulate the mind, eat a handful of almonds daily. Food allergy symptoms may sometimes be immediate and specific, and can include skin rash, hives, itching, and eczema; swelling of the lips, tongue, or throat; tingling in the mouth; wheezing or nasal congestion; trouble breathing; and dizziness or lightheartedness. But food allergy symptoms may also be much more general and delayed, and can include fatigue, depression, chronic headache, chronic bowel problems (such as diarrhea or constipation), and insomnia. Because most food allergy symptoms can be caused by a variety of other health problems, it is good practice to seek the help of a healthcare provider when evaluating the role of food allergies in your health. Relaxation can help to relive the symptoms of stress. It can help you calm and take a step back from a stressful situation. All relaxation techniques combine more deeply with relaxing muscles. This relaxation tips is very good before and after Yoga. Lying on your back, relax you lags and allow your feet to fall outward. Relax your arms, turning the hand so the palms face upwards. Gently elongate your neck and allow the chin to slightly. Soften your face and close your eyes. Breath in and out through the nose, focusing your awareness on your breath. Notice how are you feeling. Become aware of any tension, and as you breath out, imagine the tension flowing out with breath. As you breath in, feel yourself filling up with positive, healing energy. Gently place your hand over the other, palms down, on your abdomen. Exhale slowly and completely. Then inhale, breathing into the abdomen, using the position of your hand to guide your breathe. Allow the abdomen to rise and fill like balloon, then slowly exhale. hold out breath for moment then inhale again without rushing. Enjoy the feeling and the wonder of breath. Breathe into the abdomen up to 5 times. Breathing into the lower rib cage: Place your hand at the base of the rib cage and exhale slowly and completely. As you inhale, breathe in to lower rib cage and feel the lower rib expanding. Hold the breath in momentarily, then slowly exhale and feel the lower ribs contract again. Hold without breathe for moment before inhaling again. Breathe into the lower ribs up to 5 times. Breathing into the upper chest: Place the hand on the upper the chest, below the throat. Exhale slowly and completely, then as you inhale, breathe slowly into the upper chest. You feel a much deeper, fuller breath and you will feel expansion through the entire upper rib cage, front and back. Hold the breath for moment before exhaling slowly and completely. Hold without breath for moment, before inhaling again. Breathe into upper chest up to 5 times. Now just relax, no yoga is complete without the final pose Savasana. 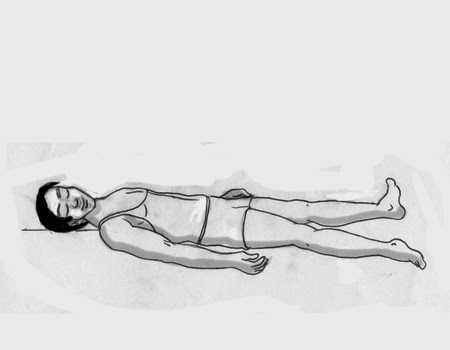 Savasana is a resting pose, its not the same a sleeping. You should stay present and aware during the 5 to 10 minutes duration of the final relaxation. Getting fit and healthy staying in good shape? Why should you exercise? Increasing the amount of physical activity step towards getting fit, feeling good and looking great. By gradually building up the amount of activity you do, you improve your body's suppleness, strength stamina. your muscles will become firmer and stronger and your heart and lungs will function more efficiently. Other parts of the body such as the liver and the nervous system also benefit from exercise. try to think of exercise as a natural ,essential part of your life - just like eating or sleeping. Taking up a new activity can also help you to forget the stresses and stains of the day and help you to sleep more soundly. Many activity, such as dancing, playing tennis or waking can improve your posture, co-ordination and reflexes as well. So you can see that exercise is an excellent all-round tonic! Exercise can really give you a boost energy on regular fitness routine can help you feel more lively, confident and happy to be alive. Exercise is beneficial to children in all the same way that it is for adults. If children are encouraged to enjoy physical activities at an early age, they are more likely to continue exercising regular throughout their lives and lower their risk of developing heart disease later on. Why not take up an activity up an that you can all enjoy as a family, like Cycling, swimming or jogging. Choose which activity you are going to take up to get fit and decide when and where you are going to do it. Make sure you choose an activity you can do regularly. You can choose more then one activity. Pick a day to begin your new, active lifestyle and write it your diary. Plan at least three times in the following week when you are going to do your activity. Ask your friend or colleague to join you and make exercise part of your social life. Remember, even if you feel you are too busy to exercise, you can probably fit a little extra walking into your routine, for example on your journey to work, a trip to the shop or walking in your house when you are on the phone. Why not try using the stairs instead of a lift or escalator? It really help. Swing your ropes; Skipping is one of the best, simplest and cheapest way to exercise. Swing ropes is especially good for you heart.There are lots of way to swing your rope without actually jumping over it, so have fun experimenting. Make sure wear a pair or good training shoes to avoid any strain on your leg muscles. If you have any Medical condition, before your start any exercise you have to ask you Doctor. Before you start any exercise always warm up with some gently running on the spot and stretching. Good about physical activity, it help you lose weight and improve your figure. It helps keep your heart strong and healthy, and reduces your risk of having a heart attack or stroke. It help you to relax, cope with stress and sleep well at night. It help you to look and feel younger. It does not mean joining expensive clubs or classes. It does not have to mean strenuous spots or workouts. Half an hour's moderate exercise a day can make all the difference. It can be beneficial for everyone regardless of your age, size or shape, or whether you have disability. You can find a books or exercise DVD from your Library. There are lots of different activity you can try!